When Formula E announced their new driver's club, it showed there were some serious racing drivers that hoped for an opportunity in the brand new series, but it didn't capture my attention completely. At this point, the list is just names who have expressed an interest in this year's inaugural Formula E championship, but it's still up to the teams to pick and choose who they want to drive for them. Today, another batch of names have been revealed hoping to participate in the 2014/15 season, and now my interest is piqued. You guessed it, included in the second batch of interested drivers is a certain Frenchman, who has more recently been dilly-dallying behind the camera for the French Formula One coverage. Franck Montagny is a highlight name on the ever-increasing list supporting the new electric series. 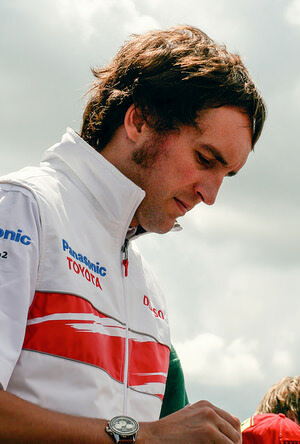 As you'll be well aware, I've followed Franck through a brief stint in Formula One, before he was unceremoniously kicked out of Toyota way before his time. I watched him battle through the weird-but-fun Superleague Formula, and also the far more credible Le Mans series. Again, he was cut off in his prime, after the Peugeot team pulled out of endurance racing. He's not a huge one for talking, that Franck, but other drivers confirmed in the club today have explained why they're interested in Formula E.
Former F1 driver Bruno Senna has said that electric cars are the "path for racing and motoring for a better future." Sébastien Bourdais, F1 and Champ Car driver, has also looked ahead to the path racing is going down. Formula E is a really exciting project and a really big innovation in motor racing. You don’t get to be a part of such technological advances very often in a career. I would be extremely happy to discover the car and begin racing next September, and I believe the best way to achieve that is to be part of the Drivers’ Club. So far the list of names on the Drivers' Club reaches sixteen, many of whom are without a race seat at the moment but almost all of whom have a reputation to uphold. There are expected to be more names revealed over the coming weeks, although there's no confirmation of when any will be selected for a race seat. The series doesn't start until September, so there is plenty of time for decisions to be made and drivers to be selected. Part of me worries it's a little bit like school. A group of people standing around and waiting to be picked for the sports team. The other part of me is simply excited that there's another opportunity waiting for these drivers. Brand new racing formulae don't come along every day, and it's a great chance for them to participate in another series, a new, fresh and exciting event that just keeps getting better and better. Unless no one picks Franck. Next post Who's in the hot seat in Jerez?